Since the advent of mass communication technologies, it has gotten a lot easier to be embarrassed. Especially in the age of Youtube, TIVO, cameraphones and widespread video surveillance, if anyone does something embarrassing, there is the potential for a viral phenomenon spreading that embarrassment across the globe. So should everyone live in a constant state of fear of messing up in front of a camera (e.g. Cristina Aguilera and "the twilight's last reaming")? Don't worry, here comes economics to the rescue! Economics is the study of the allocation of scarce resources. It's an fundamental principal in economics that when a resource becomes less scarce, each unit of the resource will be individually less valuable. Just think of a world where bountiful apple trees grew on every street corner. How much would people be willing to pay for apples? Not much, because they could just grab them off of the nearest tree. 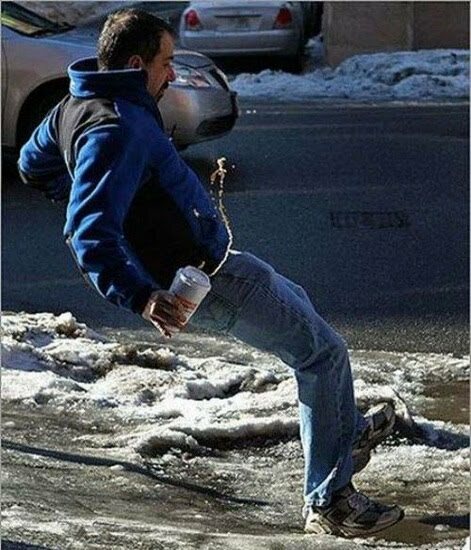 As it turns out, the internet is a bountiful tree of embarrassing moments ready to be picked. So is embarrassment a resource that people buy and sell? Yes. Though websites like Youtube and Break.com are ostensibly free, every day millions of people exchange their time for the opportunity to watch funny videos, often of real people embarrassing themselves. (To be honest, this is one of the main reasons I watch Youtube. Forget about videos with actors and scripts, I think there's nothing funnier in the world than game show bloopers.) So if the embarrassment of others is a resource that is bought and sold, what would happen if the supply of embarrassing moments captured on film were to greatly increase? Just as with an increase in the supply of apples, if embarrassing videos become less scarce, each embarrassing video would become individually less valuable. As you can see, the supply curve has shifted outwards as technology makes a greater quantity of embarrassing videos available. This increases the quantity viewed from Q1 to Q2, but also decreases the value that people place upon each individual embarrassing videos from P1 to P2. This can be very intuitively understood. If there were suddenly twice as many videos of, say, ballroom dancing accidents, each individual video will be less special to each consumer. There are only so many ballroom dancing accident videos consumers will be able to watch within their schedules. With an increased supply, the level of cultural saturation each individual viral video achieves is nothing like the earlier days of the internet. With an increase in supply, viral videos as a whole become more prevalent, but each individual video becomes less distinctive and culturally valued. 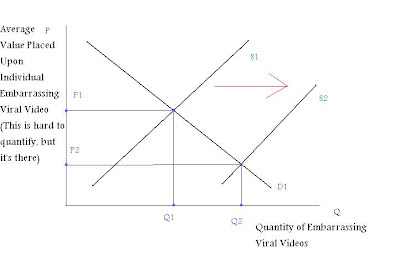 So what does this economic reasoning mean for those who have been and will be embarrassed by viral videos? Basically it's good news. While new technologies have made it so much easier to be embarrassed in front of a global audience, the abundance of supply will keep the cultural value of each embarrassing moment low, to the point that new videos may not have the universal appeal of earlier ones that became global phenomena. This decrease in cultural value and recognition in turn makes each embarrassing viral video less embarrassing. For this reason, people, especially public figures who are constantly in front of cameras, should not live in fear of slipping up and becoming the next embarrassing viral phenomenon. Excessive carefulness can be a hazard, especially in politics where the cameras are always rolling. People should act naturally as ever. Because in the future, as the internet continues to churn out mountains of content, the public's reaction to a possible viral phenomenon may just be "meh". Its a new age where everything is out there for all to see. But that gets boring after a while, doesn't it?